Endorsements for Full of Grace. 5 stars! Click here to read a beautiful endorsement by a teenage male. Beautiful! Poignant, anointed, life changing! Truly “full of grace”! I really loved it! Every once in a while I have the pleasure of reading a book which is so focused on God’s tender loving attention to each one of us individually, that I find myself experiencing the Presence of Jesus with me as I read! This is most definitely one of those books! I just finished Full of Grace on March 31, 2011. It was an absolutely outstanding read, and I was so moved by the stories of the subjects that were written about. Great work, Mrs. Watkins, a true masterpiece that I will encourage others to read, as this is one of the top four books I have ever read. The Bible is the greatest, of course. This would be a different world we live in if every human being read this book just once. The Blessed Mother and her Holy Son Jesus will triumph in the end, and I’m sure a special thank you will go to Mrs. Watkins for her efforts through Full of Grace. God bless her and your family. I love this book and handed it to my co-worker, who hadn’t been to church for years. When she was reading the book, a great heat came over her and poured through her body. She decided after this experience of reading the remarkable stories, that she would return to the Catholic Church. She handed the book to her children, who had also left the church, and after reading it, they decided to return to church, as well. Full of Grace is a remarkable tool in the hands of the Lord Himself. This is one of the most inspiring books that I have read about Mary’s intercession. I couldn’t put it down once I started reading it. 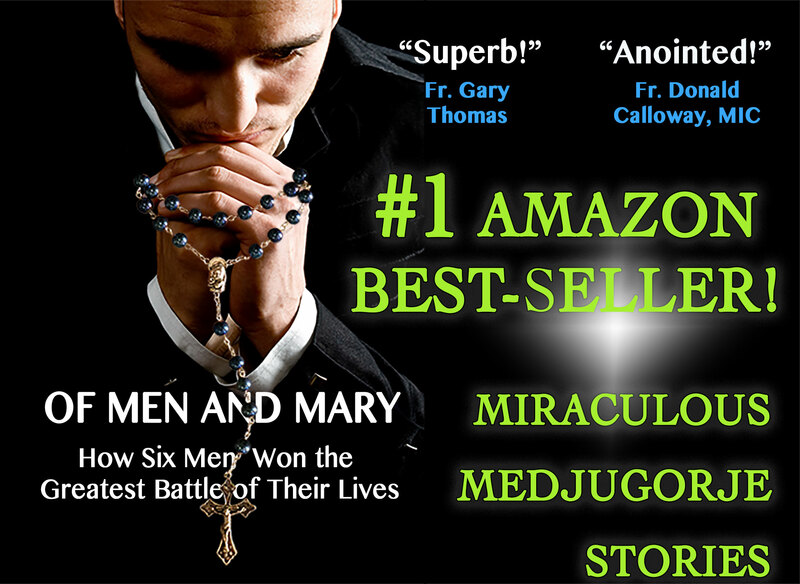 The author injects her own personal life tragedies that were turned around by Our Lady’s intercession along with stories of others that that were able to turn their lives around through the miracles of Our Lady and her Son Jesus. A book which will surely impact anyone who has doubts and feelings of despair. This book will give you hope and change your life. It has changed mine. I have read several books on Medjugorje and bought this one to take on a trip. It sounded like it would be easy reading, several personal stories so that I could read a person’s story, put it down and pick up the book for a small read during my vacation. That idea was far from the truth. The stories are compelling, makes you evaluate and ponder your soul, your thoughts, your actions, your direction, your faith and your beliefs. They are so profound that they challenge you to re-evalutate your life and what will YOU do about it. Will you answer God’s call and Mary’s plea? Whew! Some of the stories made me cry. I won’t give it away but the letters in the book blew me away. This book is now in my sister’s hand and she is feeling the same way I did. This book is going to travel through many of my friend’s hands and I know that many healings, conversions and confirmations through Mary’s intercession will result from this book. This is one of the best books on Medjugorje. You will know them by their works! I could not put this book down and plowed through it in about 4 hours. What a shot of conviction straight to the heart! It is a conversion experience just reading all the heart-mending confessions. I plan to share this work with many, many people. Prepare to be transformed and inspired! This beautiful collection of 6 true life stories are amazingly touching and inspirational. Leaving all expectations at the door, I starting reading this book on an airplane to Atlanta a few weeks ago. I thought I would just pass a little time on my 5 hour plane ride. Little did I realize that the tears of JOY would start streaming down my face! For a self-proclaimed stoic like me, the idea of TEARS in such a public venue was quite a surprising turn of events. Life presents many twists and turns in life and a few of the protagonists in this book had hit rock bottom…. and needed a bit of TLC and rescuing. Think about all those homeless people you see on the street. Do you make eye contact with them as you pass by? Do you acknowledge that they are still a part of humanity? The first story’s protagonist, Goran, hit the absolute rock bottom in life – is it possible to be a homeless thief and drug addict and ever be rescued? His story is an amazing one of redemption. Today he leads a productive, meaningful member of society. Where there is darkness, there is always HOPE…. The true story of Goran and each and every one of the additional 5 stories are source of true light and HOPE! I highly recommend this book to anyone who’s looking for the light at the end of the tunnel! Maybe this book can help guide the way. I loved reading this beautiful book. Each of the stories fully brought me into the life of the person being described. I could feel his or her helplessness and pain and then how with love and care they were brought to faith and peace through God’s attentive care. It made me realize above all that each soul is very precious to God and that He waits patiently for us to listen and respond to His whispers. Reading how God is still alive and working today in ordinary people inspired me to rejoice in the hope being extended to humanity in shrines like Medjugorje. As one can gather from the book, all that is needed for grace to effect its change within anyone is an open, surrendered heart to the Lord Jesus Christ. It is quite touching to read of this personal yielding to God in each of these unique accounts. Also moving is how each of these people wrestled with Almighty God like Jacob did with the angel in the Old Testament. This dance of partial surrender and repeated retreats from God’s holy Will, so common to the human condition, is what makes “Full of Grace” so compelling. I was especially intrigued by the insightful reflection questions posed at the conclusion of each chapter. This feature alone lends “Full of Grace” for profitable use by a book club or a religious education setting, such as a RCIA (Rite of Christian Initiation of Adults). Indeed, “Full of Grace” is much more than another apologia for Medjugorje; its testimonies of authentic conversion stir up the possiblities of a similar movement of the Holy Spirit in the hearts of its readers. I challenge you to buy “Full of Grace!” If you read it with an open heart, you too, will be numbered among the millions of souls being touched by God’s amazing grace in these incredible times. The stories in Full of Grace have the power to change lives. They show the ability of God to work in the midst of the most horrible situations. As Watkins states, “In telling their stories, these ordinary people opened the door to their extraordinary lives – to a view more fantastic than fiction – and showed how God lifted them into his loving arms, often out of a living hell, and raised them up to the heights.” Each of the stories is followed by questions and a faith exercise, useful for personal reflection or in a book or prayer group. I cannot think of another work on Medugorje so well done! Christine Watkins’ book Full of Grace: Miraculous Stories of Conversion through Mary’s Intercession certainly caught my attention! While many other works on Medugorje focus on the facts, figures and historical dates and messages of the apparitions, they seem far less significant than the personal stories of miraculous conversion which have been captured in this remarkable book. Mary is a fantastic advocate if you are seeking help to change your life for the better and for the kingdom! Anyone who seeks to appreciate how approachable the Mother of Christ is should read this book. Christine Watkins’s beautiful and touching collection of conversion stories prompted or touched by Medjugorje’s apparitions is further proof of the good fruits of this ongoing phenomenon. The stories are direct, honest, heart-rending, and miraculous. “Do Whatever He tells you.” These last recorded words in Scripture of Mary, the mother Jesus gave us from his cross, echo consistently through the ages. They have come to us again in her apparitions already approved by the Church and are repeated in the fruitful apparitions at Medjugorje. In this book, Christine Watkins presents us with deeply inspirational testimonies of six individuals who tangibly experienced Mary’s motherly protection and care and her call to give their hearts and minds to her Son through lives of service and intercession. These uplifting accounts and the reflections, Scripture passages, and thought-provoking questions that follow are sure to help one grow in faith. This book was a blessing to me. May it be a powerful instrument in God’s hands to draw lives to His grace. John Paul II—the Pope of the Last Secret—believed Medjugorje to be the fulfillment and continuation of Fatima. “. . . In the end my Immaculate Heart will triumph!” Medjugorje represents the last battle (Gen 3:15 fulfilled by Rev 12). No wonder Satan would offer to give back to God the rest of the world in exchange for Medjugorje (reported by Our Lady)! Full of Grace: Miraculous Stories of Healing and Conversion through Mary’s Intercession responds to an urgent need. Twenty-four years ago Cardinal Hans Urs von Balthasar, Pope John Paul II’s favorite theologian and the director of Pope Benedict XVI’s doctoral thesis (his acknowledged mentor and guide) warned: “There is only one danger alone for Medjugorje—that people will pass it by.” Christine Watkins’ book helps ensure that won’t happen. Start reading and you’ll find it hard to put down! These same graces await us all. In compelling fashion, Christine Watkins shares her own and five other first-person accounts of healing and conversion through the remarkable intercession of our Blessed Mother. The voices shared in Full of Grace will draw you closer to Jesus Christ through his mother Mary. Prayerful reflection questions and faith exercises round out each inspirational chapter, providing a retreat experience for anyone looking for spiritual renewal and transformation. How much do those caught in the coils of life’s deceptive attractions long to think there is a way out? I praise God that the subjects of these conversion stories care enough us to bare their souls so that others might have hope. Who could resist the arms outstretched of Jesus and Mary as depicted by these desperate souls? Read this book. Rejoice. Give it to everyone you know who is looking for happiness in the wrong places and is desperate for salvation. As I read the story of Goran, I could not help but think of how all of us, in some ways, are represented through his story. In reading about his life and the movement from misery through despair, and finally to hope and love, I saw how our Mother Mary has led him, and us, through our most difficult times. I highly recommend reading this book to experience and reflect on our own lives and how our stories meld together. In addition, the thought-provoking questions of faith can help draw us to a deeper relationship with Mary our spiritual Mother, and God. A must-read book to experience Mary’s love in our lives. When heaven draws near to earth lives are profoundly changed. These moving stories of God’s intervention will be a legacy of God’s love planted in your heart and become a doorway for you to be touched by his mercy. In the true-life stories of Christine Watkins’s book, a common reference point is how extremely lost each person was and how great was the mercy of God and the tender love of Our Lady interceding for each of them that brought them to the faith. Their lives could be called stories of “extreme conversion,” yet readers will find that this book is as much about themselves as it is about the writers.